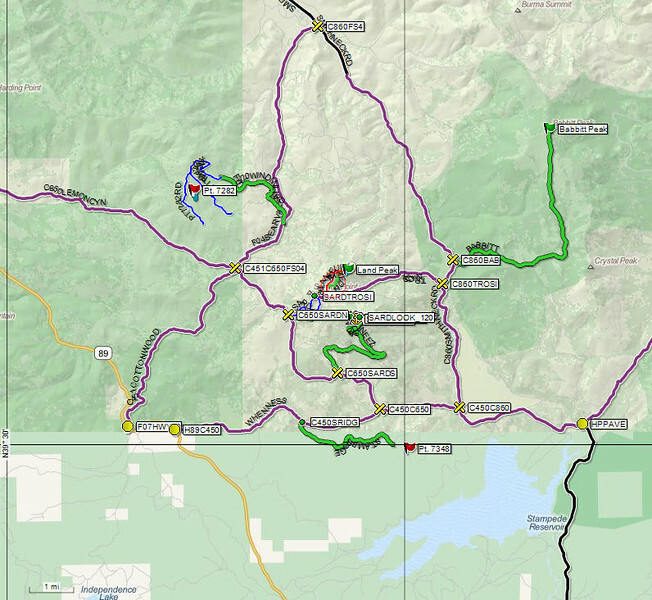 There are a number of ways to get to Land Peak and other nearby SOTA summits, plan for around 10 miles of driving on 2WD dirt roads no matter which route you choose. Rather than try to give you a detailed turn-by-turn description of all of them, the map above should be sufficient for you to plot out a driving route yourself. Stick to the roads shown in black (paved) or purple/green (good dirt roads) and avoid the ones shown in blue unless you have a rugged 2WD vehicle. A key point to target in your drive planning is the unsigned intersection at the east end of Trosi Canyon Road (C860TROSI at 39.55207N, 120.15062W) where it runs into Smithneck Road. Head up (west on) Trossi Canyon Road from there.